Group registration of 3 paxs or more for only RM1,200 per person. EQ (Scheduled Waste) Regulations 2005 (Amendment 2007), states that every waste generator shall ensure that all his employees involved in the identification, handling, labeling, transportation, storage and spillage or discharge response of scheduled wastes to attend training programs. This course is specifically designed to provide a comprehensive knowledge on overall management of scheduled waste, as required under the law in order to ensure that the generated scheduled wastes are properly managed, in compliance to legal requirements, with minimal environmental impacts. To provide knowledge on scheduled waste handling, storage and labeling. 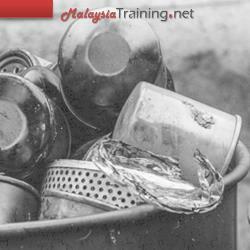 To provide knowledge on scheduled waste handling equipment and PPE. To provide knowledge on chemical emergency response plan. To provide knowledge on scheduled waste disposal.